When you are seeking a quality shoring system for your project, be sure to get in touch with Scaffold Resource. We have provided scaffolding and shoring to many high profile clients throughout the Washington D.C. area. Recently, our team was called in to erect a shoring system at Brentwood Elementary School. During this shoring rental, we were able to construct a secure shoring system that ensured the safety of all of the children who were attending the school. Our team was also able to evaluate the safety of the old structure and help to prepare the building for renovations. To schedule a shoring erection near Washington, D.C., be sure to get in touch with Scaffold Resource. From scaffolding rental to construction shoring rental and more, we are pleased to provide our clients with a range of solutions. Give us a call at (301) 924-7223 to set up a consultation with one of our scaffolding engineers. When you are gearing up for a scaffolding rental at your construction site, it is important to hold a safety meeting. In this video, you will learn some effective strategies for leading a safety meeting. In order to ensure that your workers remain safe when they are working on scaffolding, you will want to present safety tips and information in an engaging an informative manner. At Scaffold Resource , we can provide you with detailed safety information for your scaffold or shoring rental. When you are preparing for a construction scaffolding rental near Washington D.C., be sure to schedule a safety training with our team of experts. Give us a call at (301) 924-7223 to hear more about our tube and clamp scaffolding rentals. 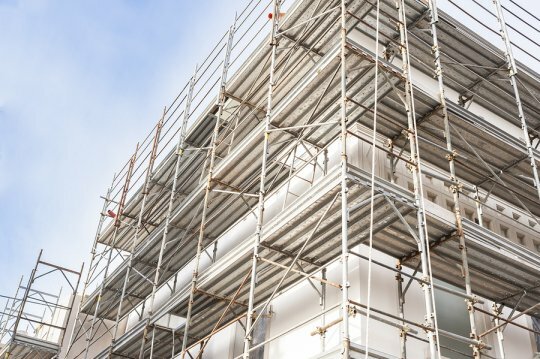 When you plan a scaffolding rental for an upcoming construction project, you will want to make sure that your workers are properly trained and educated on the basics of scaffold safety. 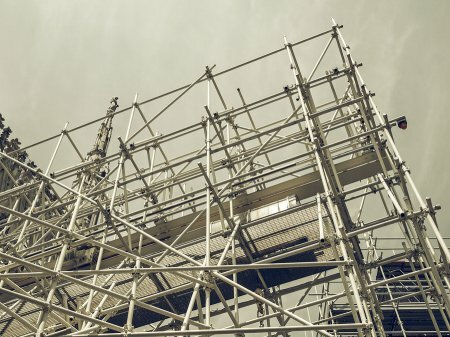 Without the proper safety measures, scaffolding can be a very dangerous part of a construction site. Fortunately, your scaffold resource will be able to provide you with tools and training to teach your workers about scaffold safety. Here is a quick look at some mistakes to avoid when you are working on scaffolding. In order to protect workers who are using a scaffold system, you will want to make sure that your scaffold has been equipped with proper fall protection. A fall from a scaffold can result in very serious injuries. Your scaffold resource can provide you with guardrails, ladders, and other forms of protective equipment that will help to prevent a fall. Along with falling from a scaffold, it is also dangerous to be hit with debris or other objects that have been knocked off of a scaffold. When you are working on scaffolding, you will want to make sure that any tools and materials that you are using are properly secured in place. It may also be a good idea to place safety nets underneath your scaffold. OSHA requires that all scaffold systems are built with a specific set of safety requirements in mind. When you are constructing a scaffold, you will want to make sure that your scaffolding meets and building and safety specifications. A scaffold that meets specifications will be able to support the weight of workers and construction materials. If you have additional questions about proper scaffold safety, be sure to get in touch with Scaffold Resource. 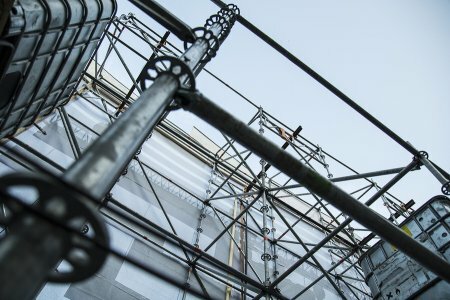 We provide quality scaffolding rentals in Washington D.C., and our team of scaffold resource technicians can help you make sure that you are using your equipment safely. Call us at (301) 924-7223 to hear more about our scaffold rental options . When the load bearing wall of a building becomes structurally compromised, it may be necessary to erect a shoring system. Shoring systems , like scaffold rentals, are metal structures that are placed along the exterior walls of a building. A dead shore has the unique function of replacing a load bearing wall. As a result, a dead shore system can keep a building structurally sound until a renovation procedure can take place. Read on for an overview of the process of erecting dead shores. Before a shoring system is erected, it is important to strut the doors and windows of the building. Door and window struts will maintain the shape and dimensions of these openings while the shoring system is in place. To help bear the load properly, the struts will be fitted with pieces of wood on either end. Needles are a key component of any dead shore system. The term needles refers to the wooden or metal beams that are inserted through the walls of a building in order to provide structural support. When the needles are inserted, they will be placed at right angles directly through the wall. With the needles and dead shoring system in place, the construction or renovation process can be completed safely. After it has been determined that the building is once again structurally stable, the workers can carefully remove the needles from the wall. To ensure that the shoring system is properly removed, it is important to take out the needles before the struts. At Scaffold Resource, we can help you design the perfect shoring system for your building project. As a leading source of scaffolding rentals in Washington D.C., we can provide you with a range of scaffolding and shoring solutions for your renovations. To learn more about the benefits of working with our top rated scaffolding rental company, give us a call at (301) 924-7223.